I took advantage today of LE’s need to get her hair trimmed, and tagged along when she ventured across the river to the borough of Etna. While she had a wash and cut, I trotted around the bit of town and then hiked up to Morelock Street to get a better look at a couple of bridges that I’ve driven over numerous times, but not had a chance to really see. 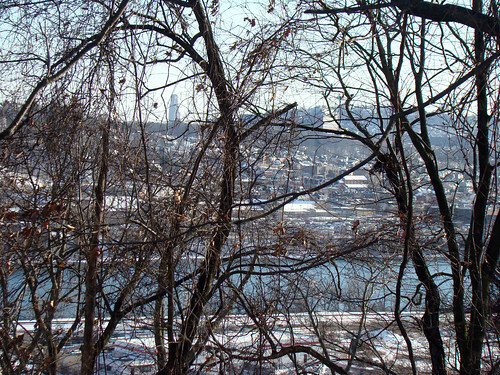 Even a pretty town can look dreary in February though, and the charms of Main Street were somewhat lost on me today. 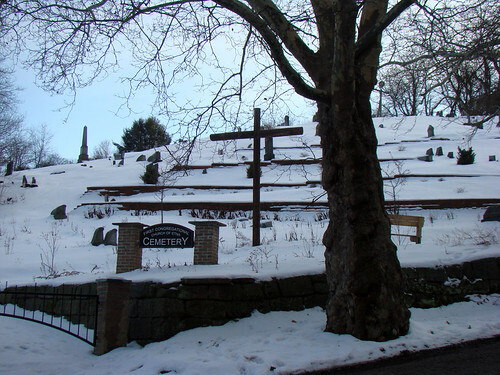 It wasn’t until I had tromped up High Street and found the First Congregational Church of Etna Cemetery that I started to get excited. 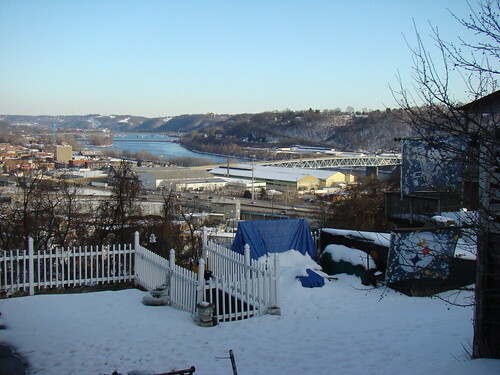 Etna is situated right on the bank of the Allegheny River, and is draped over a collection of steep slopes. The views from the tops of these hills is excellent, and I can believe that the residents of Etna congratulate themselves on their wise choice of settlement. 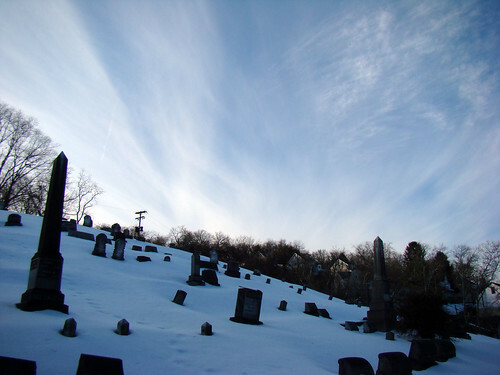 The cemetery is tumbling off one such slope, and I cut up through it, encountering on the way a young fellow teaching a kid how to snowboard among the gravestones. 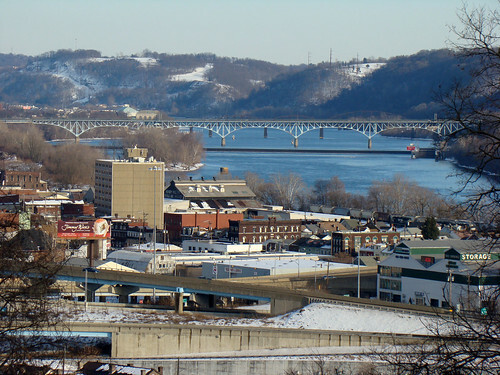 Climbing onto Morelock Street, I was rewarded with my view of the two bridges, the boroughs of Etna and Sharpsburg, and a brilliantly blue bend in the Allegheny River. 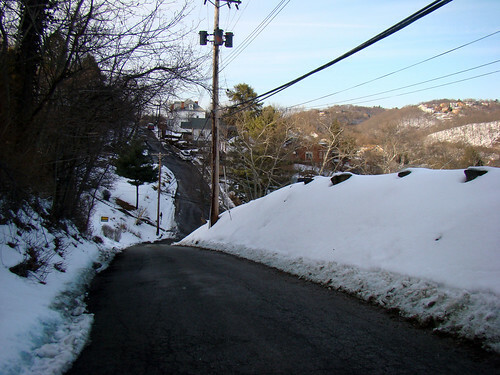 I can vouch for the fact that this road is even steeper than it looks! 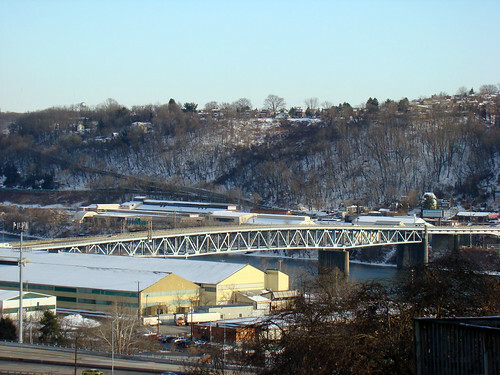 Anyway, at a time of year when the snow is dirty, and the hillsides are brown, and the trees are a long way off from budding, I take comfort in the bridges of Allegheny County, which glow warmly in the sunlight and even on a grey day bring me delight with their graceful leaps and daring cantilevers. 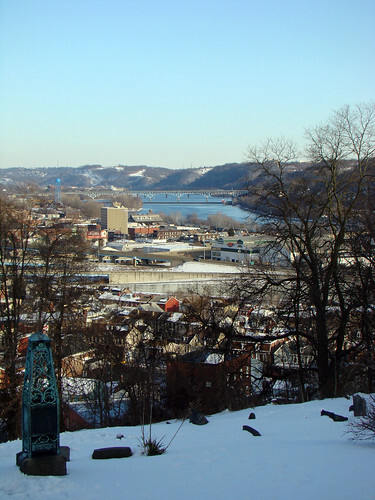 Still, I can’t wait to revisit this hillside with its rocky, rugged cemetery, when it is green and full of flowers. Snow angels are fun to make, but a nap on a grassy knoll sounds absolutely divine.